A prior Berkshire Salon installed in a stunning space. 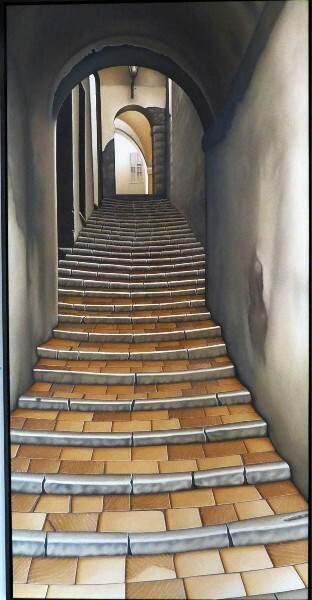 A realist painting by Pennie Brantley is among this year’s highlights. A colorful work on paper by Robert Morgan. Catching natural light by a gallery window. 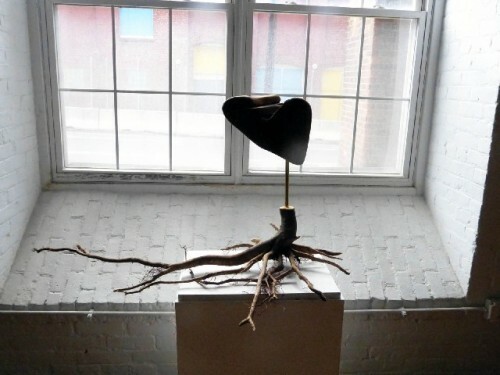 A humanistic assemblage of found materials by Opie O’Brien. With this suspended piece Dawn Nelson is spreading her creative wings. In the corridor outside the Ralph Brill Gallery. River Hill pottery in the Eclipse Mill. 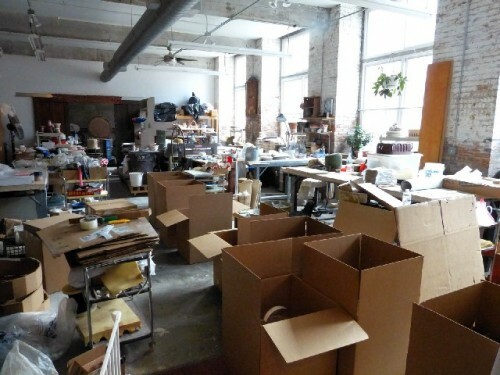 The pottery studio in the midst of shipping orders. 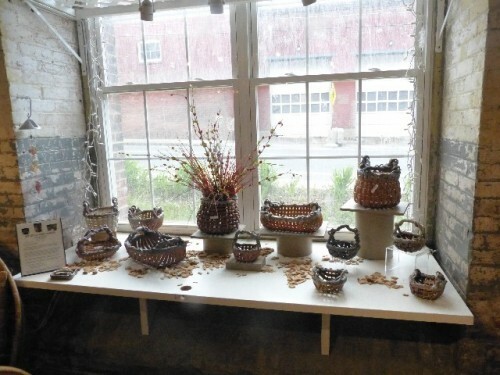 A display of pottery baskets created by Gail and Phil Sellers. More art in North Adams through Downstreet. The artist run Eclipse Mill Gallery at 243 Union Street in North Adams is the foremost non museum space in the Berkshires. 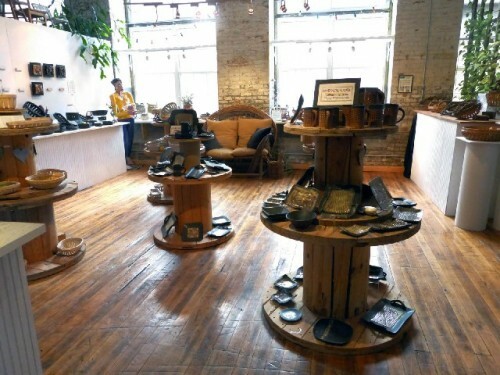 In addition to the gallery in the artist loft historic building there is also the chance to visit the studio of River Hill Pottery, the gallery of Ralph Brill, and Grover Askins' well stock used bookstore. The Berkshire Salon was initiated as a way to launch the season of exhibitions at the gallery which run through fall. 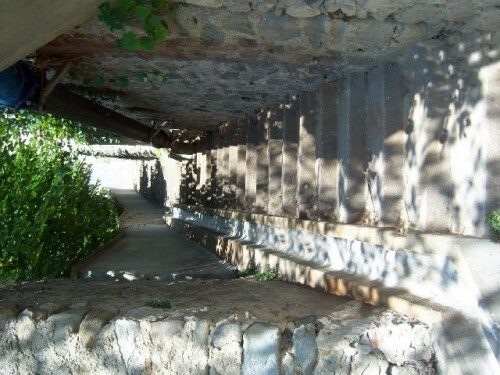 It was established as a non juried opportunity for artists in the area to show their work. This is an eclectic, accepting approach that always includes discoveries and provokes lively debates. 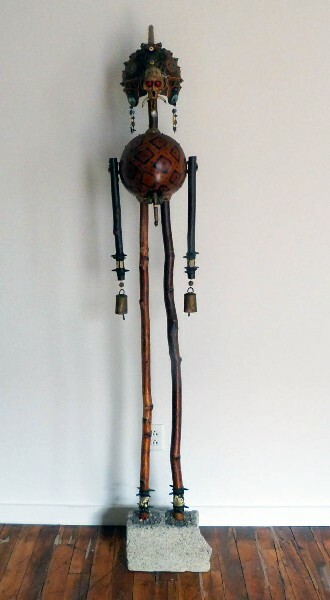 It is an opportunity for established artists to show examples of their recent work as well as amateur artists to be seen in a professional setting. There is always a great turn out and a lot of curiosity on opening night which will be Saturday, May 10 from 6 to 8 PM. Through June 1 the gallery will be open from Thursday through Sunday, noon to 6 PM. In the past the Salon was organized by a committee. This year, however, it is entirely the effort of gallerist Ralph Brill who has taken over creating the season’s program. The lively season of exhibitions results from selecting from a call for proposals. This is augmented with Brill’s projects which are frequently an aspect of traveling museum exhibitions. The quality of Eclipse exhibitions is consistent with the highest professional standards. The program of the Eclipse Mill Gallery complements the now annual Downstreet exhibitions in North Adams. During the summer months a number of vacant store fronts become pop up galleries. 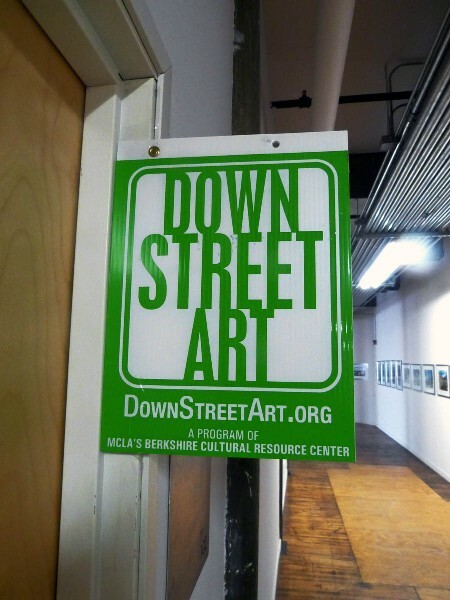 Some of these, including a cooperative gallery and Gallery 51 of nearby MCLA, have become a year round presence. It has taken more than a generation of effort but North Adams has been revitalized with an arts/ tourism economy. The former Sprague Electric campus has thrived as Mass MoCA. This summer it is anticipated that attendance at Clark Art Institute may double with the reopening of the museum designed by Tadeo Ando. This will be the first full season of MoCA’s building devoted to work by Anselm Kiefer. Previously the museum opened a building dedicated to work by Sol LeWittt. There is a bill pending on Beacon Hill that may bring MoCA some $25 million for the final phase of its development. The museum will raise $30 million in matching funds toward creating 120,000 square feet which will double its current gallery space. The forty loft spaces in the Eclipse Mill are emblematic of a long term commitment to creating a sustainable community of artists in Northern Berkshire County. There are also numerous artists living in other mills and properties in North Adams. The 7th annual Berkshire Salon provides a sense of what’s going on. Check it out. "Great article on a great Gallery and I like the inclusiveness of the growing art scene in North Adams....."
"I miss those art reviews the Eagle used to run." "It's always fun to see the Berkshire Salon. After a particularly tough winter it signifies that the summer arts season is officially launched. Thanks for the hard work and best efforts of all who have organized and shown in the salon over the past seven years. " 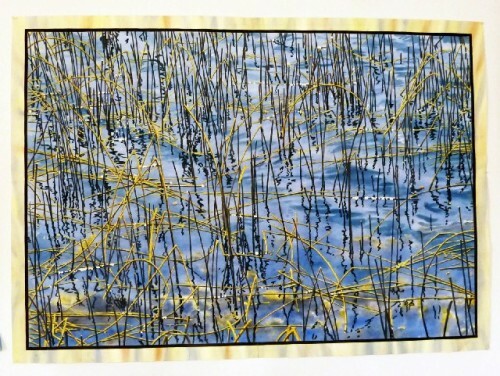 "Charles, thank you for this splendid article announcing the annual salon and promoting many of the outstanding visual arts offerings in the area. It is always a pleasure to participate in the salon, sharing camaraderie with other artists. 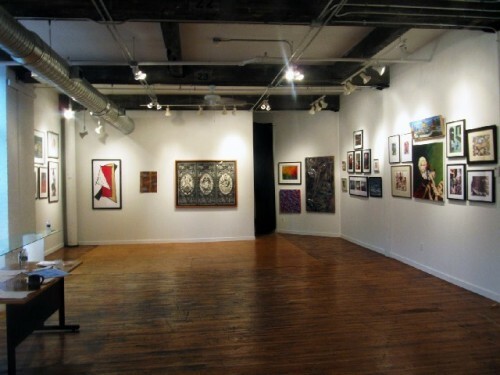 Absolutely, the Eclipse Mill Gallery is a magnificent space to exhibit in. ...Many thanks to you, Astrid and Ralph for your generous and invaluable contributions to supporting art and artists of the Berkshires and far beyond."